.com living: Good luck Jack! It's the end of an era. 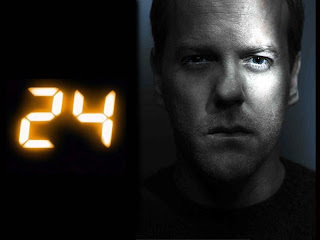 I have just finished watching the last episode of the last season of "24", which is expected to be the last one. I have loved the show a lot but I really feel like it was time for it to finish. After so many seasons, though the plots have always been intriguing and fun, the originality was gone. It must be pretty hard to come up with ideas linked to terrorists attacks in US soil. Jack is gone, he vanishes on the screen as the countdown goes all the way to zero. If I did not know I'd say that this is just the end of the season and that a new one will be coming next fall. But that's it. Enough suffering for Jack. It is obvious that Kiefer Sutherland has always carried the weight of the show on its shoulders but we cannot forget about Chloe O'Brian, Tony Almeida, President David Palmer and a bunch of other characters that have made this show memorable. Good luck Jack wherever you end up going!